Paddle your own path through the numerous rock gardens, snorkel the crystal clear waters, keep your eyes peeled for the Bays friendly dolphins. A true classic kiwi adventure trip. Eat healthy camp cooked meals prepared by our guides with pride and care using local produce.  All efforts are made to make ecological choices and minimize waste. 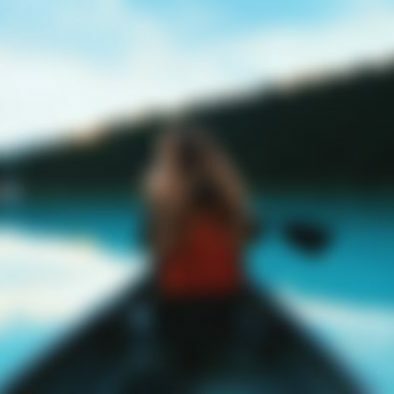 We will pick you up from your Kerikeri accommodation at 9am and after taking a short ferry ride from Opua To Okiato we will continue along the beautiful coastal road out to Rawhiti in the outer Bay of Islands. We put in at Kaimarama Bay, which is at the road end; from here it is only a 30-minute paddle across the Albert Channel to our camp for the next two nights on Urupukapuka Island. 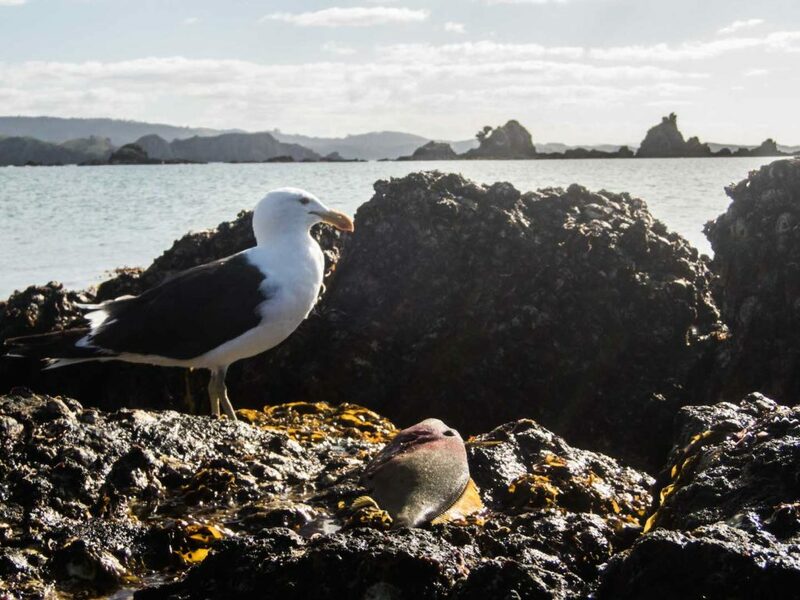 We typically arrive here in time to set up camp and have a quick lunch on the beach before continuing on with our afternoon’s paddle that will take us into the heart of the Bay of Islands, exploring the tranquil beaches of the western side Urupukapuka and the nearby Poroporo Islands. Arriving back in camp an aperitif and a stroll up the hill are often on the cards, Followed by a wholesome home cooked meal. After a good breakfast to get us well set for a day on the water we will take advantage of any morning calm to make some ground along the western side of Urupukapuka, This is the wild side! 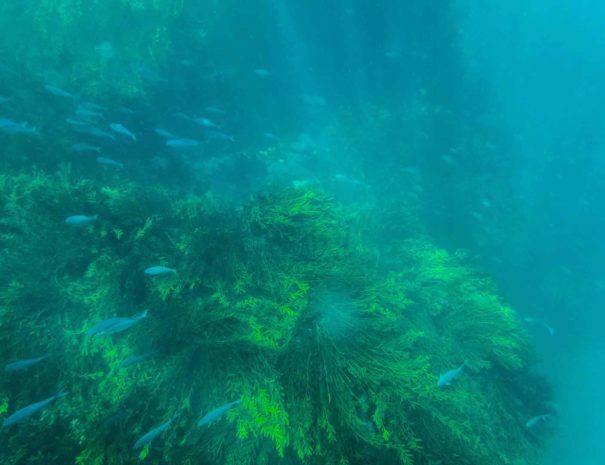 Steep cliffs plummet into the sea, Deep caves boom in any swell and the kelp fronds wash up and down the rocks with the surge. 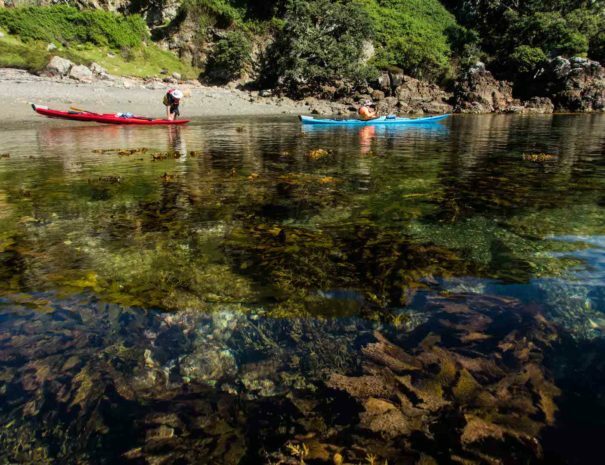 It’s dramatic and makes for some of the most stunning kayaking NZ has to offer! 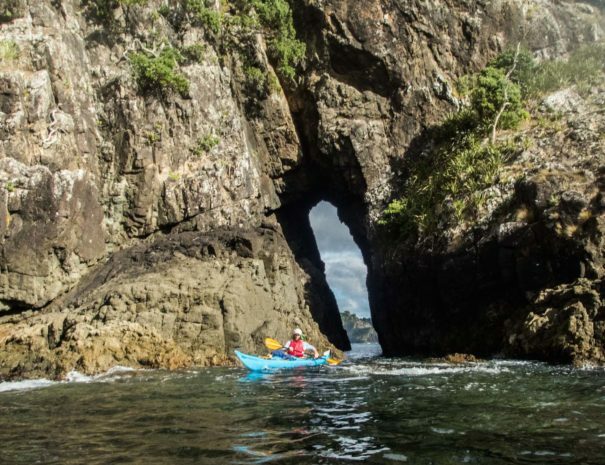 Easy to enjoy for paddlers with any level of ability we will take the time to check out some caves and narrow passages before entering the Waiwaitoria passage that leads us back into the protected waters of the Bay. Lunch be will on a beautiful beach followed by stroll up a hill or into the bush to find some of the islands awesome bird life before a leisurely afternoon paddle brings us back around the island to our camp. Another night in Paradise and another scrumptious camp cooked meal await. Our final day, after breakfast we’ll strike camp and get our boats packed up. Once on the water we will head back across the Albert Channel and head down the outer coast of the Rawhiti Peninsular towards Oke Bay. 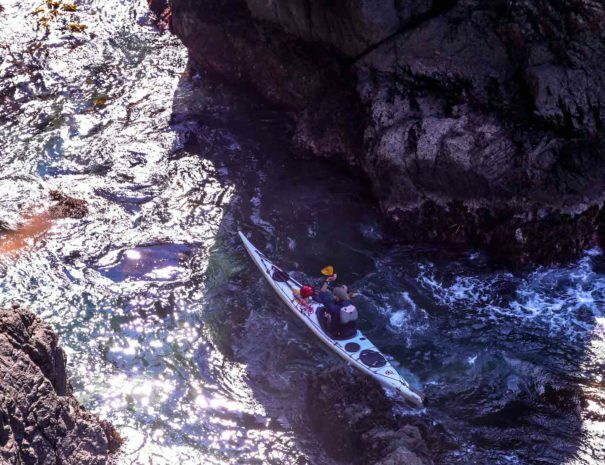 Similar to Urupukapuka’s western coast this stretch affords some stunning paddling and is highly aesthetic! We often lunch in Oke bay before continuing out along the coast towards deepwater cove. Numerous little beaches make for some great stops along the way with excellent snorkeling opportunities. As the day draws on we will turn and run back toward s the Albert Channel and our waiting shuttle. We are generally back in Kerikeri by 5pm. This itinerary is a guide only and is subject to change with the weather and the ability/desires of the group. 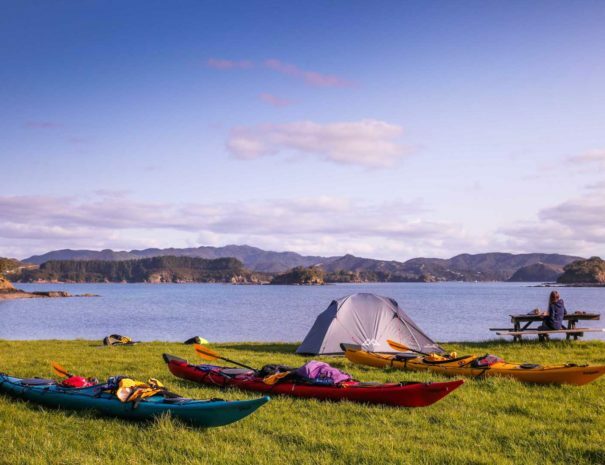 Join us for the Bay Of Islands best adventure trip!